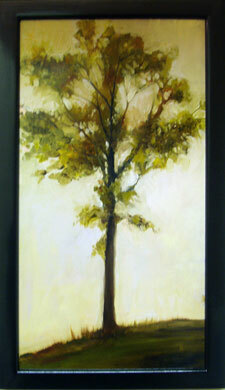 Julia Jensen's oil paintings on wood panel display a familiarity and directness of technique which could only come from years of study and practice. Her visually tactile and expressive brushwork draws as much from intuition as it does from observation. Fond of the slightly glossy and reflective surface produced by the use of linseed or possibly stand oil added to the pure oil paint, it seems that she also enjoys the fluidity and transparency which the thinned oil allows the brush. This is evident by the confident joy one senses in the very brush strokes she lays down to describe her subject. In paintings like "Winter Landscape" and "Moors," loose, transparent, quickly applied brush strokes connote strong twilight tints of fading evening. In "Winter Landscape," a familiar blueness to the snow shadows drifts across the fields. Darkness has already entered the distant hills, at the horizon, on the upper left, and into the bare black winter branches stretching over that corner of sky. This dramatic range of deeper values works because of the presence, behind the silhouette of a tree, of the vestiges of the last strong light of the day, lingering at the horizon, a remnant that puts this deepening light in perspective. In "Moors" there is another moment of fading light in a hilly landscape, but this is the warm light of a sunset glow. Jensen seems to look for a moody intensity in nature extending to the romantic-melancholy expressed by such paintings as "Marsh" and "Polpis, Dark." The first is a 9"x18" vertical composition; the second, a 16"x20" horizontal. Most of the work in the show fit within these dimensions. 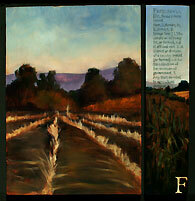 Represented equally with the landscapes was a group of diptych compositions also painted in oil on panel. The choice of wood panel, over canvas, references very early Western painting, such as Russian icons, 15th century Christian tempera on panel, ancient Mediterranean and even Egyptian painting on wood panel. The usually larger half of the two diptych panels is a "pictorial panel," and the juxtaposed (and generally smaller) one is a "text panel." The two together create a "picture dictionary" effect, one with a descriptive depiction and the other with a large alphabet letter, a word that starts with that letter, and a dictionary-like definition of the word. The text elements, combined with the beautifully painted corresponding picture in each, offer potential for humor, mystery and narrative. 1. The apparent junction of earth and sky. 2. Figuratively, range of perception or experience. 3. A plane passing through the eye of the spectator and at right angles to the vertical at a given place. The lower corresponding panel is not as predictable as one might expect, as the horizon illustrated is seen through woods as light glimpsed between the dark vertical trunks thinning into the distance. In the small central section of the previously mentioned upper section, a more generic and simplified depiction of a horizon with a thin blue line of hills can be seen in miniature. Hung above this piece during February was another of the diptychs entitled "I.eye". The text half of this pair is simplified as a large lower-case letter "i" and the pictorial half below has a sliver of a face peeking between dark vertical rectangles with its human eye. Intensely blue, with a reflection of light, its dark, mesmerizing pupil stares directly into the eyes of the viewer. Could this be Julia Jensen's own eye? Other pieces in this group had titles such as "L.emons"; "N.apkin"; "M.idday"; and "E.gg". 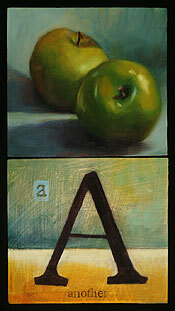 Jensen's adeptness at painting the figure is apparent in two other diptychs entitled "B.ack" and "G.rasp". The latter shows a slightly tensed hand holding a white rectangle. The former is a classical female figure seen from behind; delineating shadows define her back. Julia Jensen was born in Brooklyn, New York. She grew up in Boston and on the island of Nantucket. She majored in art history at Tulane University and following college worked at the Francesca Anderson Gallery on Newbury Street in Boston. Jensen continued her study at Harvard Graduate School of Design and the Museum School at Boston's Museum of Fine Arts. She has studied with Bill Hunt, Rick Campman, Joel Babb and Nancy Gusnick. All of these academic, professional and artistic studies have obviously combined well for this artist thus far. Judging by the success of her recent show at the Catherine Dianich Gallery, there are many local collectors who collectively agree.